Yeah, I like it. Here is a bigger image. I generally have a good imagination but it is sometimes hard for me to reimagine the wooden beard/knobby nose animation of TCW and Rebels in live-action form. I chose that image because it is the most live-action looking. It is from a video game, but all the clones were cgi in AotC and RotS. With the couple of Naboo stock images as background, it looks not too far from film quality. I think that's a good image choose for Storm Commando Heavy Weapons guys. I chose Phase II Shock Troopers to be my image for Imperial shock troopers in my SWU by deciding that they never updated their armor when the Republic transitioned to Empire. It's fitting because according to lore shocktroopers were the original "stormtroopers" (stormtroopers being a nickname for clone shock troopers before clone troopers as a whole began being called Imperial Stormtroopers). Also in my SWU, Imperial shock troopers kept being clones-only so in the classic era they are one of the last vestiges of the clone army. I got the 5,000 ammo capacity for the power generator from the Canon article, but they have that as the normal ammo capacity which is ridiculous. The Legends article has the 200 ammo blaster pack which makes more sense with your weapons, but doesn't mention an ammo capacity for the power generator, only that it can be attached to one "for longer use". What do you think for power generator price? That raises another question. 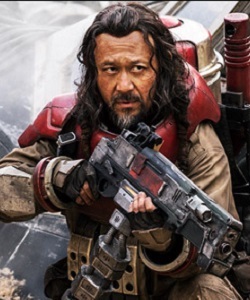 How would you stat the repeating blaster that Baze Malbus of Rogue One used, the MWC-35c "Staccato Lightning" repeating cannon? They call it a "heavy repeating blaster" but they don't mean that by the EU standards. I'm guessing that is the reason that the canon article for "heavy repeating blaster" doesn't connect with the Legends one of the same name. The description is so auto-fire with the two firing modes of more shots/chances to hit, and single shots of greater damage. I'm guessing the second option is what he was doing with the pump-action at the end of the film before he died. The weapon cost is only 3000 credits, but the power generator for it (I'm guessing that's what he's carrying on his back) has a 35,000 ammo capacity! With the backpack generators in Rules of Engagement, hooking up a repeater to a backpack gave the trooper essentially infinite ammo, at least that was my understanding of the set up. Actually, going by my Auto-Fire rules, a 500-round drum would be a better fit, as a Full-Round Burst using all 4D of Auto-Fire uses 500 rounds. Plus, since the standard Light Repeater under my system has a 600-round drum, it would have similar ammo consumption, minus 100-rounds for the power supply that feeds the rotary mechanism. Going by that, a power generator would have the capacity of 10 power drums, plus power the rotary mechanism, so I'd put it at 1,200 credits. How would you stat the repeating blaster that Baze Malbus of Rogue One used, the MWC-35c "Staccato Lightning" repeating cannon? Off the top of my head? I'd treat it as a Medium Repeater, but without the Move/Shoot Penalty (due to the ammo being carried on his back), along with the proviso that it's an elite weapon, not commonly available. It's been a while since I read the Auto-Fire rules, and I haven't implemented them yet (next adventure!). If I understood you correctly, here are the changes. How's this look? Should the Power Drum cost more? Elite and rare, check. But that's a hefty weight to be lugging around on someone's back. I think it should still be limiting in some way. Should the Power Drum cost more? I don't think so. It's basically the same size drum used in the Light and Medium Repeaters. But that's a hefty weight to be lugging around on someone's back. I think it should still be limiting in some way. The Move and Fire penalty was more to represent the bulk of the weapon being held by a character's arms. Moving a portion of that weight onto the character's core makes it easier to carry by redistributing the total weight of the weapon system. That in combination with being a customized weapon (modified with after-market parts for lighter wight) is how I justify it.